It is always an honor when someone reaches out to me for a special project they have in mind. This flute was no exception. This piece was commissioned by a gentleman in Scottsdale Arizona who had a vision for a flute he wanted. Originally this project was to have a Bison theme to it but soon after we started construction there was a change request which we agreed to as it seem to make perfect sense. 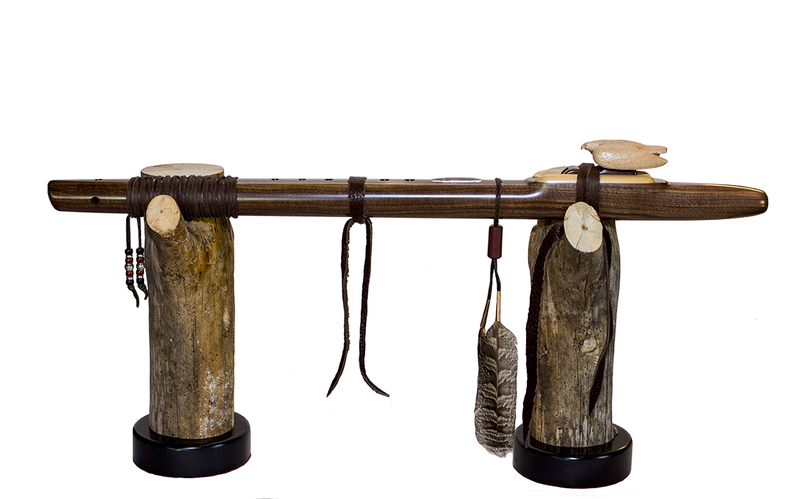 This 6 hole flute is hand crafted from Old Growth Black Walnut and features Old Growth Alaskan Yellow Cedar Fetish rails. The Eagle fetish is crafted from both Black Walnut and the bird itself is from Maple. As with every flute I build specifically for someone I look for the story behind the project. In this case this buyers story fit the end product we will finally deliver this week. The genesis for this flute started back in the mid 1850’s when pioneers heading west brought with them Walnut trees to be planted around their farm houses and barns. The walnut this flute came from was harvested from trees planted just west of Boulder Colorado and as best we can tell the tree was planted around 1850 or so. The Alaskan Yellow Cedar used for the rails comes from Old Growth trees cut from Vancouver Island that are at least hundreds of years old and the Maple also came from the Boulder Colorado area. So this lumber has traveled another 500 miles north to my shop here along the Snake River here in Jackson Wyoming. Then one last journey of 900 miles to its new home in Scottsdale Arizona. The Eagle Theme was something I had not really done previously and when Jim shared with me other eagle fetish designs he had seen and liked I knew I would need to find a fetish that fits within my whimsical fetish designs and its coming marriage to this flute. I did not want this to be in any way a representation of someone elses work. Because I live along the Snake River there are many Bald Eagle nests around my home and while on my afternoon walks I would watch the males fishing from above. This fetish is my representation of watching these magnificent birds dive for fish along the river and this is where the idea for this particular bird came from. colors in the stone perfectly. One really cool feature is the way the feathers (replicas) are hung from the flute body. In stead of using trade cloth and sinew to wrap the upper portion of the leather straps I hand crafted a stone bead crafted from a piece of Catlinite (Sacred Pipestone) and it acts kind of like a bolo tie which makes it easy to adjust and even remove the feathers if desired. Another time-consuming value add but well worth the effort as it really makes or a clean presentation. The stands came right out of the forest behind my home here in Wyoming. I guess you could say they are truly repurposed tree branches. Anyway I wanted to make something simple, yet functional and look good too. Finally I added a hand crafted Bison leather case for the flute to be carried or stored in. Hand crafted by Leah Burgess from Riversong Leather Studios out of Laramie Wyoming. This is a beautiful work of art all in its own right. Future Commissions are available for those interested in a project of their own so reach out to me with questions at “timjen333@gmail.com” … I would love to make one for you.